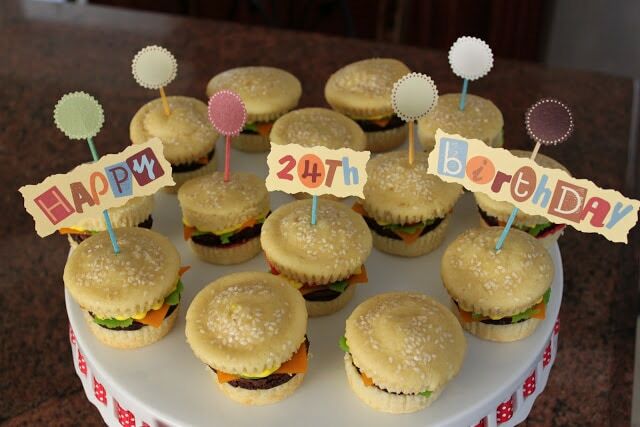 In honor of Alexander’s birthday, a sweet interpretation of his favorite food– cheeseburger cupcakes! I think I’ve mentioned it before that I don’t like cupcakes. 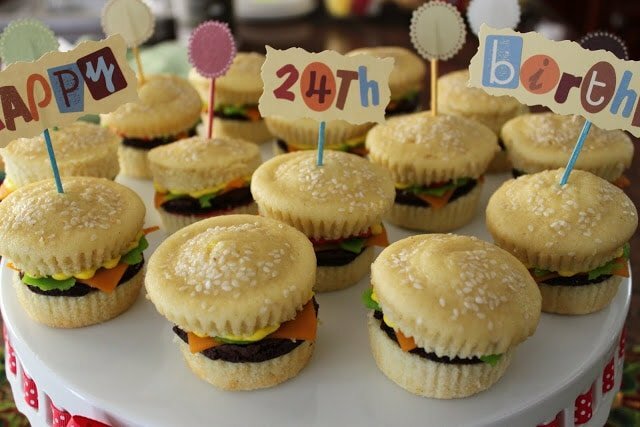 The boom in cupcakes in the recent years the has produced a slew of overhyped, overpriced, and disappointing cupcakes. What once excited me, has made me bitter. I refuse to purchase cupcakes. I would much rather make them at home. But maybe I also don’t like store bought cupcakes because they are loaded with frosting. I like to eat plain cakes. Anyway, Alex is the best and that is why I made a cupcake exception for him. He ties with my parents as my number one fan. He believes in me more than anyone should be believed in. He always lets me choose where to go out to eat and he never refuses to share dessert with me (but in the process he has gained 20 pounds. sorry). I met him when I was in culinary school up in Napa Valley. He was on the hot/savory side and I was on the sweet side. Match made in heaven. 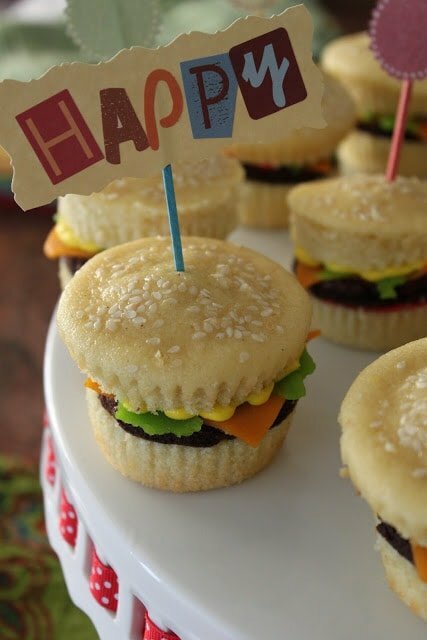 The buns are made out of buttermilk vanilla cupcakes sliced in half. Espresso chocolate brownies are the meat patties. I colored marzipan to the make the cheese and lettuce. You can also use almond paste or fondant. 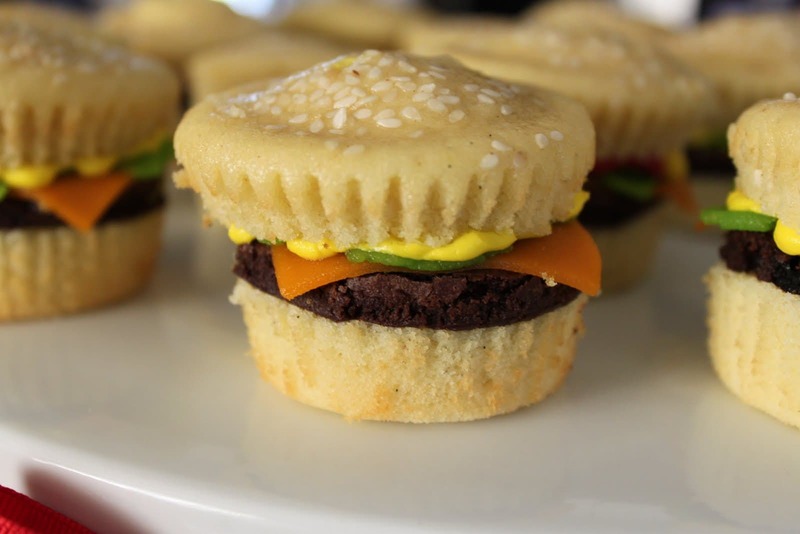 The ketchup and mustard are made from a simple buttercream. Follow the recipe and sprinkle white sesame seeds on top of each muffin before baking. Preheat over to 350 degrees F. Line 13x18-inch half sheet pan with parchment paper and set aside. Melt butter and chocolate together over a bain-marie. Once completely melted, remove from heat and stir in sugar. Whisk in eggs one at a time making sure each egg is fully incorporated before adding the next one. Pour out the batter onto a half sheet tray lined with parchment paper. Spread the batter evenly with an offset. Bake for 30-35 minutes. Divide the marzipan in half. Color one orange. I used a combination of lemon yellow and electric orange gel paste from AmeriColor. Color the other one, green. I used a combination of lemon yellow from AmeriColor and a dark green gel color I got from Williams-Sonoma. Roll out the orange into a thin sheet and cut out little squares. Roll out the green into a thin sheet and using your fingers, tear pieces to the size of lettuce you want. Cream the butter and sugar until pale and fluffy. Add the vanilla paste and continue to mix until combined. Divide the buttercream into two small bowls. Color one yellow and the other red. You can easily find marzipan at the supermarket. I also found them at Target and Wal-mart stores.